• I. J. T. N: Newsome and Co. This page includes a number of examples of British hallmarks that should show you want to look out for when your are trying to read British hallmarks. I hope you have read my page about British hallmarks so you know that you should be looking for all four parts of a hallmark. I have also included a bit of history for some of the companies mentioned that I hope you find interesting. 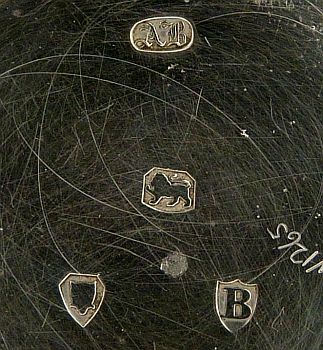 These British hallmarks were struck on items of gold or silver manufactured in the UK. From 1842 imported gold and silver items should also have been assayed and hallmarked in a British assay office, but very few were. From 1867 imported gold and silver items should have been stamped with an "F" mark denoting Foreign origin in addition to the usual British hallmarks, but again very few were. From about 1874 increasing numbers of foreign gold and silver watch cases began to be hallmarked in British assay offices, and there are examples of some of these further down this page. British watch and watch case manufacturers objected to this and new hallmarks to be used on foreign watches were introduced in 1887 to be used from 1 January 1888. No watches are known to exist with these marks. The British hallmarking of foreign watches was effectively halted until 1 June 1907 when new rules and a new set of hallmarks for imported watches were ordained, and from that date all foreign gold and silver watches were hallmarked with British import hallmarks. If you have a gold watch and you look at a table of date letters in a book of hallmarks such as Bradbury's, bear in mind that the shield shapes around the date letters used on gold items were different to those used on silver items and that the tables of date letters usually show only the shield shapes for marks on silver. There is an example of this at Cautions about using tables of hallmarks. There is only one book that I am aware of, Jackson's Silver and Gold Marks, that shows the London Assay Office shield shapes used on gold as well as those used on silver, but not even this shows all the shields used on watch cases. You are welcome to email me via my contact page if you need help with a hallmark or date letter. British pocket watches from the nineteenth century are often found in cases which have a fixed inner "dome" that is seen when the back is opened to wind the watch. The way to see the movement with a case like this is not immediately evident, it has to be swung out from the front of the case and the dust cap removed. For how to do this and more about cases see watch cases. Thanks to Ken in the USA for the pictures. Hallmarks - click image to enlarge. Thanks to Darren W. in Auckland for the picture. 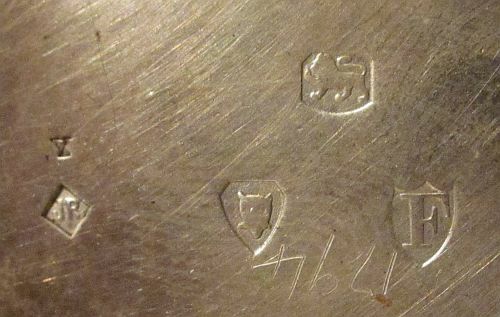 These hallmarks are in the British made cases of watches made by the company of William Ehrhardt Ltd. of Birmingham, England. The lion passant or walking lion with raised right forepaw, the mark for sterling silver. An anchor: the town mark of the Birmingham Assay Office. The date letter in the picture of the full case back is a capital "k" in a rectangular shield with curly base: the date letter of the Birmingham hallmarking year 1909 to 1910. The date letter in the cropped picture is in the face "Black letter small" and is the "o" of 1888 to 1889. 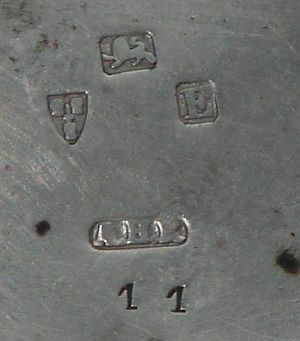 Note that the Birmingham Assay Office used unique shield shapes like this one for date letters on watch cases in the nineteenth century that are not shown in any published table I am aware of. 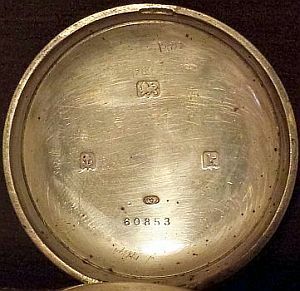 In the picture of the full case back the sponsor's mark is "W.E" in an oval shield, the registered mark of William Ehrhardt. This mark was first entered in February 1907. 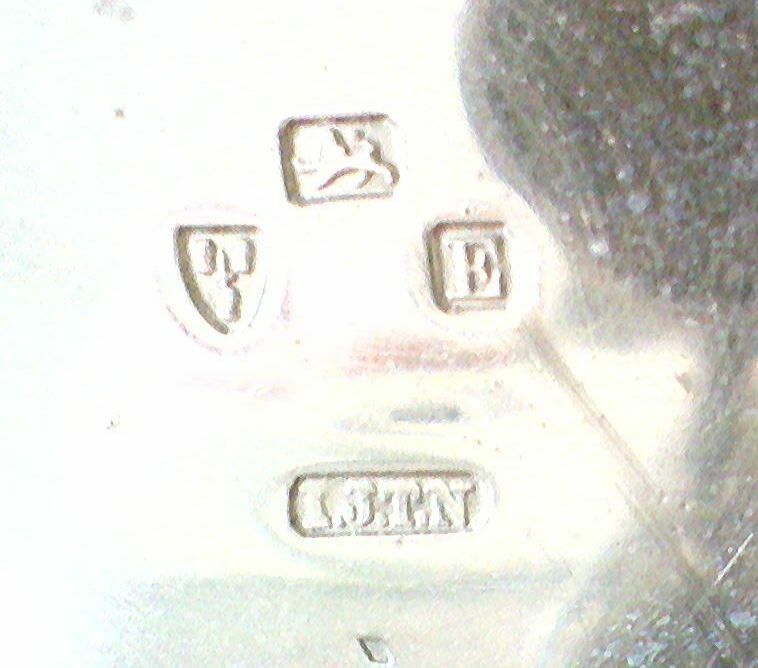 The cropped picture shows the earliest mark entered by Ehrhardt at the Birmingham Assay Office, the intials "W.E" punched incuse in November 1867. Several other forms of marks were entered by Ehrhardt over the years between these two marks. William Ehrhardt first entered a sponsor's mark at the Birmingham Assay Office on 14 November 1867. The specific punch used on the watch case shown here was registered on 20 February 1907 by William Ehrhardt Ltd. 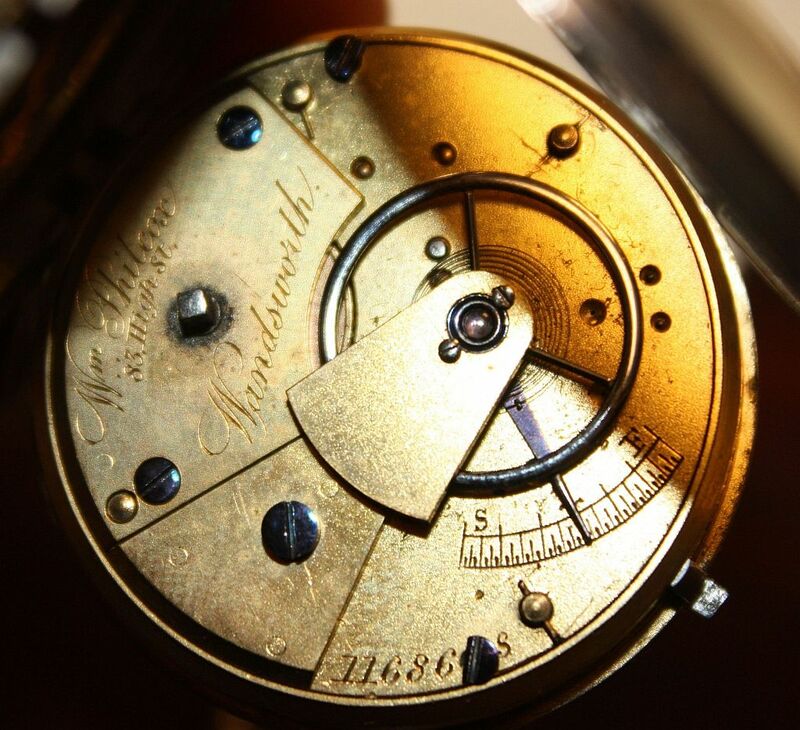 In 1856 Ehrhardt set up a company in Birmingham to make watches by machinery. This was before John Wycherly set up his factory in 1866 in Prescot, Lancashire, and before Aaron Dennison formed the Anglo-American Watch Company in 1871 in Birmingham, so Ehrhardt was one of the pioneers of watchmaking by machinery in England. Ehrhardt was not in England at the time of Ingold's doomed venture in the 1840s, and perhaps would not have been swayed by it anyway. Ehrhardt chose Birmingham because it was away from the traditional centres of English watch manufacturing where watches were made by hand using craft skills and factory methods would be opposed, as Ingold had been. Ehrhardt wanted machine operators for his factory, not traditional watchmakers. From 1856 to 1863 Ehrhardt operated from addresses in Paradise Street and Augusta Street in Birmingham. In 1864 he moved to Great Hampton Street, and an advert with this address in 1872 says that he has ... constructed machinery to make his patent keyless movement on the interchangeable system. In 1874 he built a new factory, Time Works, in Barr Street to increase production. It is thought that by this time Ehrhardt had produced 200,000 watches. Ehrhardt was granted a patent, No. 6406 dated 1894, for improvements in the hand setting mechanism of keyless watches. When William Ehrhardt died in 1897 his sons William and Gustav Victor carried on the business. In the obituary notice it was said that 500 watches were made per week with 400 personnel. Production peaked around 1900 when 250 persons were employed, including many girls who attended the machines, and 600 to 700 watches were made per week. The lower number of employees but greater number of watches made per week imply that Ehrhardt's sons had increased the productivity of the workforce by increased use of specialised machinery. From around 1920 the company used the name "British Watch Company Ltd." on some of its watches, most likely hoping to gain patriotic support in the face of growing imports, a sign of the pressure on the few remaining English watch manufacturers. The company survived until some time after 1924 so was one of the very last English watch manufacturers. By 1926 the Barr Street address was being used in adverts promoting Gustav Victor as a watch cleaner and repairer, but with no mention of watch manufacture. The company used the two trademarks shown here. 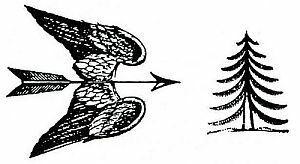 The winged arrow was registered on on 4 February 1878 and sometimes varies from the exact shape shown here. The tree was registered on 4 August 1911 and was used on watches that carry the British Watch Company name. 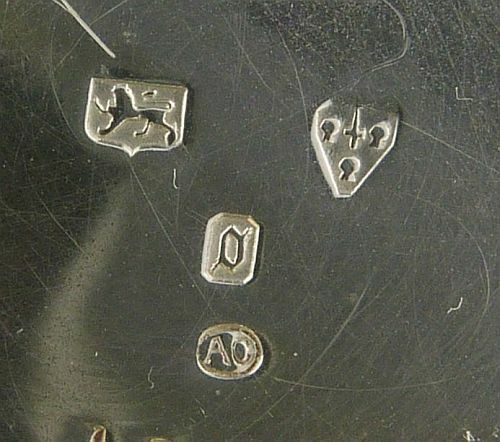 These hallmarks are in the British made case of a watch "made" by Alfred Henry Read of Coventry. An upright sword between three wheatsheaves: the town mark of the Chester Assay Office. The date letter capital "E" in a rectangular shield: the date letter of the Chester hallmarking year 1888 to 1889. The sponsor's mark "A.H.R" in a rectangular shield, the registered mark of Alfred Henry Read. The number 11 below the hallmarks is probably the joint maker's mark. The hinges on watch cases are called "joints" for some unknown reason, and making them was a skilled craft that one man dedicated himself to. There were many specialist trades involved in making a watch case including case maker, joint maker, pendant maker, bow maker, springer, boxer-in, engine turner and polisher. If you click on the images to the right, you should get a bigger view. The initials JW on the movement plate are for John Wycherly of Prescot, an English pioneer of mass produced rough movements or "frames". In 1866 Wycherly set up a factory in Warrington Road, Prescot, with three floors and steam power to produce plates and other parts by machinery that were interchangeable. The number 7673 on the watch movement is Wycherly's serial number for the movement. The 12 followed by an 0 over a 3 gives the size or "calliper" of the movement, the size being the diameter of the bottom (dial) plate measured by a pair of callipers. This calliper size is called the Lancashire gauge for determining watch sizes. A diameter of 1" plus 5/30 inches for the mounting flange was taken as the base size and called zero (0) size. Each 1/30 inch increased in diameter increments the size one number. The 12 on this movement indicates that it is 1 and 17/30 inches diameter. The 0 over 3 indicates the pillar height, the distance separating the two plates of the movement. Standard pillar height was taken 1/8" indicated as 0/0, with increments indicated above the line and decrements below in 1/144". For more about this see watch sizes. Wycherly's methods were an advance of the normal method of manufacturing in England at the time. Prescot was the location of a large industry producing frames, mostly in the time honoured craft way, largely by hand with hand powered tools and simple hand operated machines. These frames were then sent to London or Coventry to be finished and built into watches. How complete they were is not clear, but some at least had to have the escapement added in London, so the frame may have been just the simpler parts of the movement, the plates, spring barrel, fusee and train wheels and pinions. The Coventry Watch Museum Project records Alfred Henry Read working as a "watch manufacturer" between 1883 and 1901. Read was "manufacturing" watches by buying frames from Wycherly and finishing them, and then putting them into watch cases with his sponsor's mark on them - he might have employed a few apprentices or journeymen to do the finishing, and had his own workshop for making cases, but much of the work would probably still have been done by "putting out" - sending the part finished watch to various specialists working in their own homes or small workshops to have each stage of the work completed. 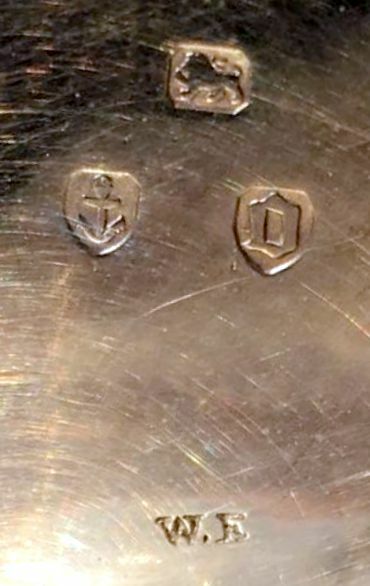 These hallmarks are in the British made case of a watch made by the English Watch Co. of Coventry. The anchor: the town mark of the Birmingham Assay Office. The date letter "d" in an old English script font: the date letter of the Birmingham hallmarking year 1878 to 1879. Below the these upper three hallmarks is the trademark of the English Watch Company. Finally the sponsor's mark "R·B" in a rectangular shield, the registered mark of Robert Bragge. 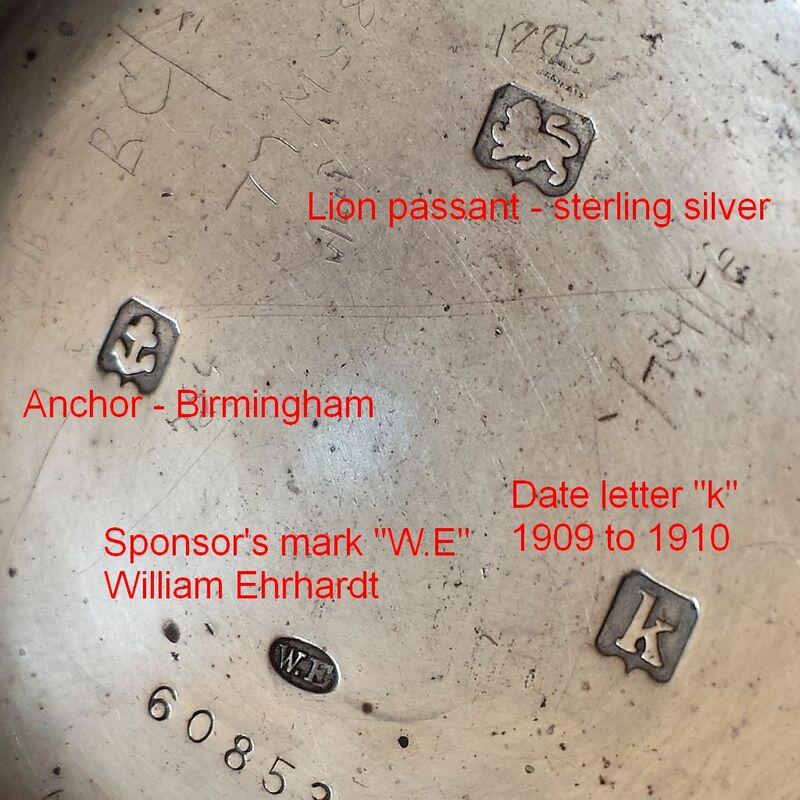 Note that the shields in this hallmark around the Birmingham Assay Office town mark and the date letter cameos are not the same shape as shown in the published tables but instead have a point at the base and flat top. This was a shape that the Birmingham Assay Office reserved for watch cases. According to Priestley there are two candidates for the sponsor's mark "R·B" in a rectangular shield; Richard Baker of Coventry who registered this mark in 1838, and Robert Bragge of the English Watch Co. who registered an apparently identical mark in 1878. This shouldn't happen, but record keeping was not as efficient then as now and it could be that Baker had ceased work in the intervening 40 years between his registration and Bragge's. The trademark of the English Watch Co. clearly shows that this particular mark is Robert Bragge's. The name on the movement, William Philcox, 83 High Street, Wandsworth, is that of the retailer, not the maker; it was common practice at the time for the retailer to have their name engraved on the movement by the manufacturer. The square boss in the middle of the barrel bridge, between "High St." and "Wandsworth" is where a key was applied to wind the watch. This square is on the end of the barrel arbor and winds the watch mainspring directly. This was because the machinery on which the plates were made was designed for the American market, where the use of a going barrel which drove the train directly was the norm while English watchmakers were still clinging to the use of the fusee. 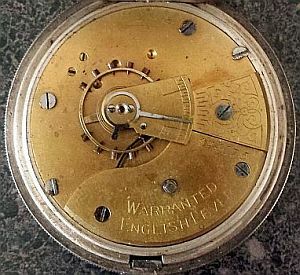 In an English watch with a fusee the key was applied to the fusee arbor and wound anticlockwise, so later versions of English Watch Co. watches were made with an extra gear to replicate this direction of winding for the comfort of English customers, although the watches remained driven by a going barrel and not a fusee. The first user of machinery in England to produce watches in any significant quantity was most probably Aaron Dennison, although John Wycherly and William Ehrhardt were also among the earliest British users of machinery for watchmaking, starting earlier than Dennison but using machinery in a less integrated and more piecemeal way. Dennison left the American Watch Company of Waltham in 1861 after financial problems that led to the failure of the first company and disagreements with the subsequent owners. He came to England in late 1863 as an agent selling patented American machinery to the iron trade in Birmingham, England. On a trip to America in 1864 in conjunction with this agency he was approached by A. O. Bigelow to help set up a new watchmaking company in Tremont, USA. Bigelow's idea was to make watch plates and barrels by machine, and import the other parts from Switzerland. This was successful and the company moved to a new factory in Melrose, USA, with the intention of making all the parts of the watches and producing 100 per week. In this the company overreached itself and it failed in 1868. Dennison was asked to find a buyer and after much searching found investors in Birmingham, England. The Anglo-American Watch Company was formed in October 1871 at 45 Villa Street, Birmingham, with Dennison as manager and also owning rights in the machines. This was well before Rotherhams, the most successful and therefore best known of the English mechanised manufacturers, bought their first machines from the American Watch Tool Company in 1880. The initial products, uncased movements, were sent to America for sale but there was little demand because of over supply. Cutmore says that the company was wound up "late in 1874" and sold for £5,500 to William Bragge, who "renamed it the English Watch Company". However, Priestley records a special resolution of the Anglo-American Watch Company passed on 11 February 1874 that changed the name to English Watch Company, and another special resolution passed on 9 June 1875 proposed the voluntary winding up and sale of the company. The date of 1874 given by Cutmore seems to be wrong. 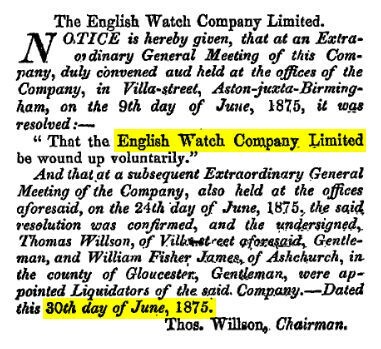 The London Gazette report reproduced here shows that The English Watch Company Limited of Villa Street, Aston-juxta-Birmingham, was wound up voluntarily in June 1875. The initial resolution was made on 9 June. This was confirmed at a second Extraordinary General Meeting on 24 June when Liquidators were appointed. It seems likely that Bragge purchased the company, which was already named The English Watch Company Limited, from these liquidators. The notice to creditors posted by the liquidators required all claims to be submitted before 1 August 1875. When the assets were sold to Bragge is not recorded but Cutmore may well be right with his "late" in the year remark, i.e. the sale to Bragge being "late in 1875" rather than 1874. It seems that Bragge did not buy the whole company but bought only the buildings and machinery from the liquidators, creating a new company called "The English Watch Company". This was not a limited company and explains Cutmore's remark that he changed the name, the name being changed from The English Watch Company Limited to The English Watch Company, which was also a different legal entity. An Extraordinary General Meeting of The English Watch Company Limited was held on 20 December 1881 for the purposes of hearing from the liquidators how the winding up had been conducted and assets of the company disposed of. That was the final end of the first "The English Watch Company Limited". The Watchmaker, Jeweller and Silversmith reported in February 1882 that the The English Watch Company of Birmingham was to become a limited company, The English Watch Company Limited. The capital of the Limited Company was £50,000 in £10 shares, although it appears that only half the amount was called up in the first applications. The freehold buildings, plant, machinery, stock in trade, goodwill, patents and trademarks had been valued on a going concern basis at £21,000. This was the second "The English Watch Company Limited". The works at Nos. 41 to 49 Villa Street, Lozells, Birmingham, were said to have been in active operation under the present management for "about six years", which would imply from late 1875 or early 1876. The workshops had been planned for the purpose of watchmaking by steam machinery, the lighting being especially good with windows on both sides of each workshop looking out onto gardens. The watches made were exclusively English levers and "the several parts of the same sizes [of movements] are interchangeable". Large orders were flowing in from the Indian, Colonial and Home markets with the "revival in trade" after the depression of the 1870s. The English Watch Company continued to use the Melrose machinery for making plates and barrels, but was still dependent on the import of parts from Switzerland. In 1880 it was reported that that 200 men were employed and the machinery was little improved, the escapement and much of the material still came from Switzerland. William Bragge ran the company until about 1883 after which his son Robert took over. In 1885 at the 4th Annual General Meeting the shareholders were told of the death of the 'founder' William Bragge, an enlargement of the workshop costing £950 and a new and more powerful steam engine by which a 50% increase in production could be obtained. A patent was purchased from Mr Douglas of Stourbridge for his double chronograph and his stock of finished and unfinished movements and materials. The patent was probably No 4,164 of 27 September 1881 which allows the fitting of a centre seconds hand and minute counter to a normal watch, either on the conventional dial at the front or a back dial. The chronograph part was operated by a three-push button. The English Watch Company proposed to produce a combined repeating and chronograph watch known as the 'Chrono-micrometer' and one was exhibited at the 1885 Inventions Exhibition in South Kensington. The watch was a minute repeater with the chronograph showing minutes, seconds and fifths. This was an ambitious project in a different class of watchmaking to those previously made. In 1886 the company was reported to be very busy and in 1890 Robert Bragge and the company took patent 2,856 for 'Improvements in Chronographic watches'. The good times didn't last and on 11 February 1895 an Extraordinary General Meeting of The English Watch Company Limited passed a resolution that the company should enter voluntary liquidation. This time it was not resurrected. It is thought that Williamsons of Coventry bought some of the machinery. London hallmarks 1883/84 on 18 carat gold. Click image to enlarge. Fridlander movement. Click image to enlarge. These are London hallmarks in an 18 carat gold case. The sponsor's mark was entered at the London Assay Office by Alfred Fridlander, a watchmaker of Coventry. 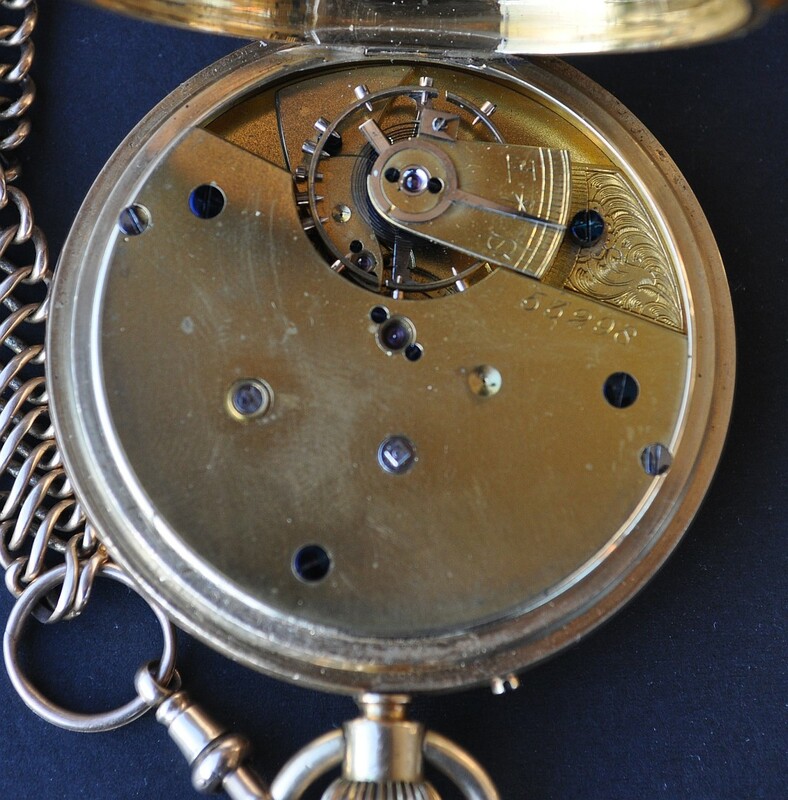 It is likely that the movement was finished in Coventry from a "frame" made in Prescot, and that the case was made in Coventry in Fridlander's factory. The sponsor's mark "AF" in a square shield — the registered mark of Alfred Fridlander. In the centre: a crown above an 18 — the standard mark of 18 carat gold from 1798. To the left the date letter "H" — the date letter of the London hallmarking year 1883 to 1884, see the note below about the date letter shield shape. To the right the leopard's head, and no other town mark — indicating the London Assay Office. If you click on the image you should get a bigger view. Alfred Emanuel Fridlander (1840 - 1928) was born in Birmingham and became one of Coventry's most distinguished watchmakers. By 1871 he was living in Coventry and gave his employment as a watchmaker employing 30 men and 6 boys. He is recorded at Holyhead Road Coventry. The sponsor's mark of the initials AF in a rectangular shield with cut corners was entered at the London Assay Office by Alfred Fridlander. It appears to be one of three similar punches that Fridlander registered between 1872 and 1882. Fridlander's first registration at the London Assay Office was on 13 October 1868 with a similar mark differing only in that there was a pellet between the A and the F, like this: A•F. Fridlander supplied many London retailers with watches. This included supplying S. Smith and Sons with many watches including their first non-magnetic watches, some of which were exhibited and awarded a gold medal and diploma at the 1892 Crystal Palace Electrical Exhibition. Fridlander also supplied movements for the Royal Geographical Society waterproof watches, often called traveller's or explorer's watches. Many Fridlander watches were tested at the Kew trials and received Class A and Especially Good certificates, often having Kaurrusel revolving escapements and cut bimetallic temperature compensating balances. Fridlander became a wealthy man having diversified, like many Coventry manufacturers, into the bicycle and motorcycle business, where he became a director of the Triumph Cycle Co, the Auto Machinery Co. and Leigh Mills Co. These companies were set up in Coventry to use the skills the local workforce had gained in watchmaking that became available as watchmaking in the city declined and the workers looked for other employment. Fridlander became a town councillor and Justice of the Peace (J.P.), and he served in that role for 28 years. 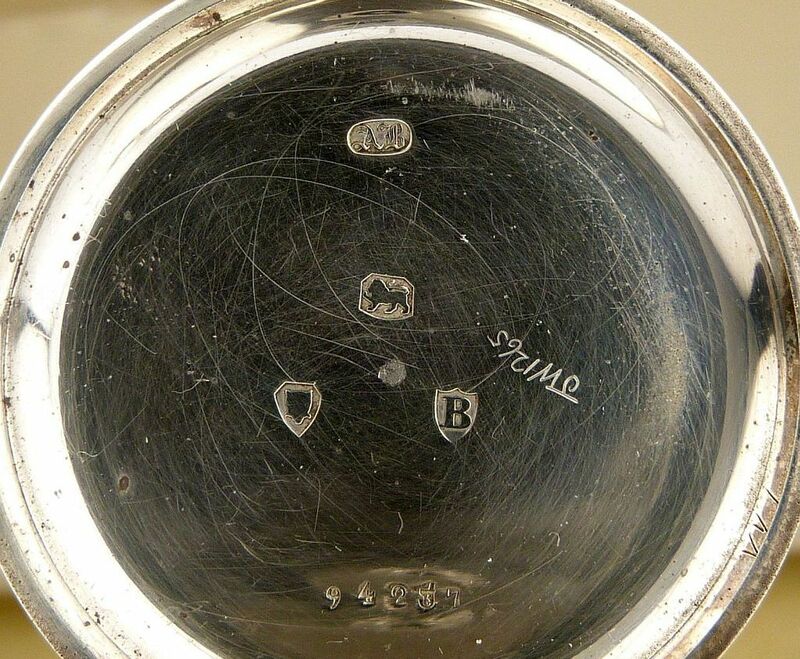 These hallmarks are in the British made case of a watch made by Rotherham & Sons of Coventry. The lion passant or walking lion, the mark for sterling silver. The sponsor's mark "JR" in a diamond shield, the registered mark of John Rotherham. 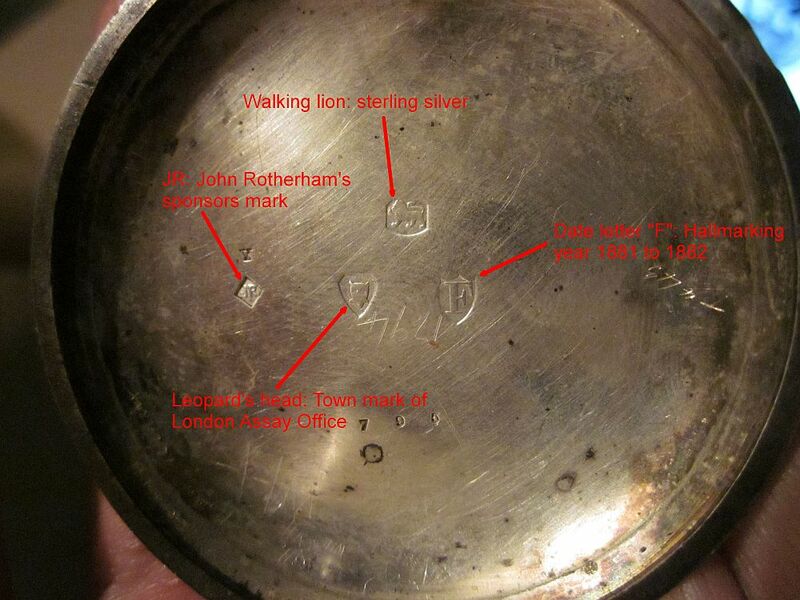 The leopard's head: the town mark of the London Assay Office. The date letter "F": the date letter of the London hallmarking year 1881 to 1882. If you click on the image of the hallmarks to the right, you should get a bigger view with each mark highlighted. NB: Don't confuse the "F" date letter of this hallmark with the cameo mark "F" (for "Foreign") in an oval shield that from 1867 onwards should have been struck on all imported gold and silver items. The "Foreign" mark would obviously not have been struck in an English made case, but should appear in foreign watches from 1867 until 1887 but has never been seen (unless you have one? If you do, please let me know). I. J. T. N: Isaac Jabez Theo Newsome, Newsome & Company. 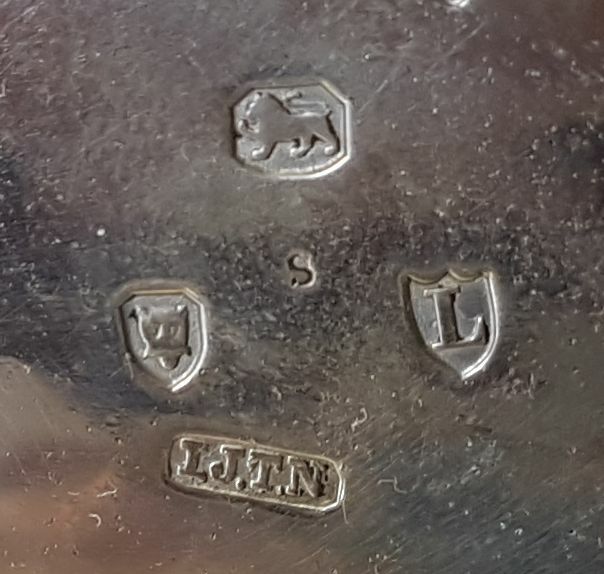 IJTN: Newsome and Company, Chester 1888 / 1889 Hallmarks. The hallmarks in the two cases shown here both have the same sponsor's mark, I.J.T.N in cameo within a rectangular surround. Punches with this mark were entered at the Chester Assay Office on 7 November 1884 and at the London Assay Office on 21 November 1884 and 22 April 1886 by Isaac Jabez Theo Newsome with the address 14/15 The Butts, Coventry, giving his occupation as watchmaker and watchcase maker. Another punch with the came initials in cameo but with a diamond shaped surround was also entered at the Chester Assay Office on 7 November 1884. The lion passant or walking lion, the standard mark for sterling silver. The town marks of (1) the Chester Assay Office, an upright sword between three wheatsheaves, and (2) the leopard's head of the London Assay Office. Note that when the leopard's head is struck with no other town mark it signifies the London Assay Office, but some other assay offices struck the leopard's head as a standard mark in addition to their own town mark. The Chester hallmark has assayer's mark or date letter "E" for the year 1888 to 1889. The London hallmarks has the date letter "L" for the year 1886 to 1887. Remember that hallmark date letters span two calendar years, for brevity only the first year is shown in most references. Jackson's is the only reference that shows the correct two year span. The sponsor's mark I.J.T.N in cameo within a rectangular surround. NB: Philip Priestley has the London punch as being entered by Newsome & Yeomans but this is incorrect. All the I.J.T.N punches were entered by Newsome after Newsome and Yeomans had parted company in 1878. Notice how the three assay office hallmarks are arranged in a regular triangle formation, whereas the sponsor's mark can be at a random angle. 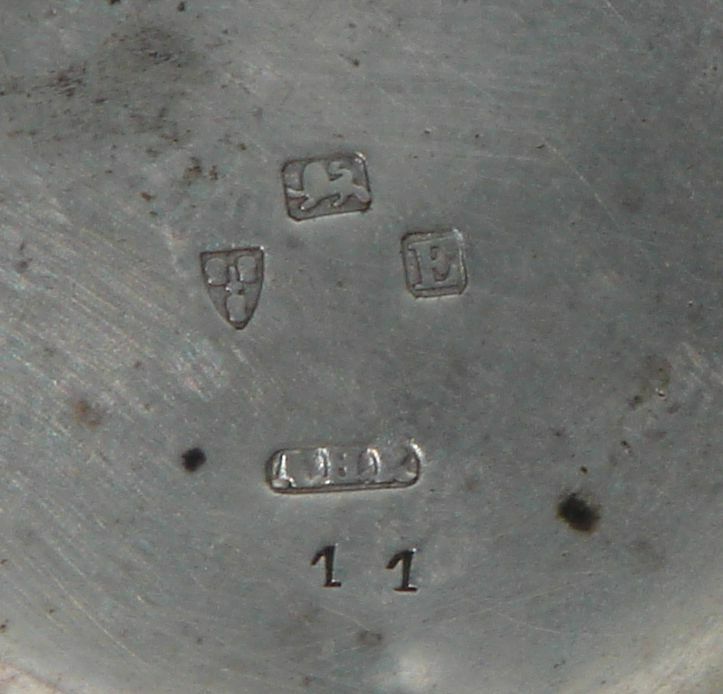 This is because the sponsor's mark was struck with a single punch before the case was sent to the assay office, but the three assay office marks were made by a "press punch". This is one punch that carries all three marks which was applied to the case and driven home by a fly press. This method of marking was used to speed up the process of marking the large numbers of gold and silver watch cases submitted for hallmarking. This is another feature that can be used to detect fake hallmarks in watch cases if they are not punched in a regular triangle pattern. Newsome & Co. and Samuel Yeomans are regarded as leading English watchmaking companies of the late nineteenth century, but there is frustratingly little written about them. Their reputation is based on the high quality of the watches they produced and their results in the watch trials at Kew rather than making large quantities of watches, although they did make use of machinery and the gauge principle to reduce manufacturing costs. Newsome & Yeomans of Spon Street, Coventry, advertised in the Watchmaker, Jeweller and Silversmith in the 1870s as "Wholesale Watch Manufacturers ... Silver English Lever Watches of every description; also gold lever watches, three-quarter and full plate; Three-quarter Plate Keyless Centre Seconds Stop Watches in Gold and Silver. The Performance of every Watch guaranteed for a number of Years." On 29 Aug 1874 Samuel Yeomans entered his details and an "SY" cameo punch at the Chester Assay Office as a Watchcase & Watch Manufacturer. In December 1875 the Watchmaker, Jeweller and Silversmith reported that Messrs. Newsome and Yeomans had opened a new factory in Coventry. The address is not stated but it must be Spon Street, Coventry, because Newsome and Yeomans adverts continued to give this address until 1878, and Yeomans continued on Spon Street after the partnership had ended. The main workshop on the first floor, where it was well supplied with daylight, was 120 feet in length and accommodated over fifty workmen. On the ground floor was another workshop about forty five feet in length, along with a heated cloakroom, and a tea room. The report said that "Altogether the factory is certainly one of the most complete, although not the largest, which we have inspected." Newsome and Yeomans Separation, June 1878. The report said that "Their watches are all made by the aid of machinery to gauges, a system having many decided advantages, the chief of which is, that in the event of any wheel or pinion being broken or lost, it may easily be replaced without sending the entire watch. One special branch of their extensive business is the manufacture of the higher class gold ¾ plate, centre seconds, keyless, watches." The remark that spare parts could be sent out is somewhat puzzling because, in common with most English watchmakers, Newsome rarely put their name on the watches they made. The visible name, usually the only name, was almost always that of the retailer. In which case, how a watch repairer would know to contact Newsome to ask for parts is something of a mystery. Newsome and Yeomans separated in 1878, as evidenced by the separate adverts for Newsome & Co. and S. Yeomans reproduced here from June 1878. Samuel Yeomans remained in Spon Street, Newsome moved to 14, Butts, Coventry. The partnership of Isaac Jabez Theo Newsome and Samuel Yeomans was recorded as formally dissolved on 5th February 1879. On 7 February 1878 Jabez Newsome entered his details and a "JN" cameo punch at the Chester Assay Office as a Watchcase & Watch Manufacturer. This suggests that the dissolution of the partnership of Newsome and Yeomans was in the air in early 1878. Newsome, 14 Butts. Image courtesy of Bygone Spon End, Chapelfields and Nauls Mill. The address quoted by Ridgway and Priestley for the 1878 cameo punch mark is 14 & 15, Butts, Coventry, but this is an error. The earliest adverts by Newsome & Co. such as the one reproduced here were for 14 Butts, only later was 15 included. 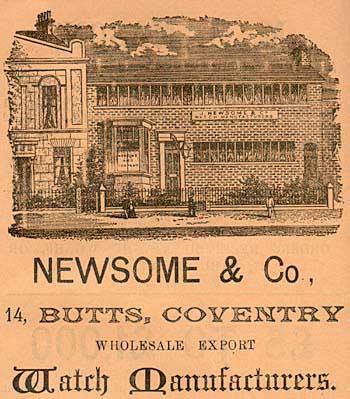 Newsome and Co. advertised from the address 14 & 15, Butts, Coventry, in the Watchmaker, Jeweller & Silversmith in the 1880s as watch and chronometer makers. This is puzzling as English streets normally have even numbers on one side of the road and odd numbers on the other side. Today number 15 Butts Coventry is occupied by Chicko's Café & Restaurant, flanked by The Mint Restaurant at number 13 and Istanbul Restaurant at number 17. However, information kindly provided by Robert Witts at the Coventry Archives and Culture Coventry is that a 1905 trade directory indicates that postal addresses at that time were numbered consecutively, so 14 and 15 were next to each other, and on the opposite, North, side of the road to the current number 15. A 1905 OS map shows the watch factory between York Street and Thomas Street (which no longer exists), opposite to today's number 15 and where the West side of the multi storey car park of the Ramada Hotel is today. According to the 1905 trade directory, the right side of the Butts (including Newsomes) runs from number 1 to 70, and the left hand side runs from number 71 to about 100. This was before extensive slum clearance and redevelopment took place from the 1930s onwards and the current, more usual, numbering scheme was adopted. In 1888 Newsome & Co. patented a "safety wheel" to guard against breakage of the mainspring in movements with goings barrels. This arrangement consists of a compound wheel, intermediary between the barrel and the centre pinion and gearing with both. The barrel teeth are cut on the middle of the barrel rim, which distributes the friction equally on both ends of the barrel arbor. The first of the compound wheels gears with the barrel, while the second gears with the centre pinion as the barrel would normally. Between the two wheels are a click and ratchet, similar to those in the going fusee. When the mainspring is driving the train of wheels, the click takes into the ratchet and the compound wheel acts as one wheel, but should the action of the barrel be reversed, as it would were the mainspring to break, the top wheel will simply ratchet the click round preventing any further damage taking place. In 1890 a new chronograph was manufactured by Newsome and Co. for registering one-sixtieth part of a second. The patentee and inventor was Mr. Robert Turner of 53 Princess Street, Bury. The escape-wheel arbor was fitted with a second wheel of forty eight teeth, which geared with a pinion of eight teeth that carried a hand on its axis round a small auxiliary dial divided into 60ths seconds. The result being that, with the ordinary chronograph train of 18,000, the small hand makes a complete revolution per second. The rest of the train was as normal and there was also a centre-seconds hand on the large dial. In March 1891 the death of Mr. I. J. T. Newsome was announced. The business was carried on as usual by the surviving partners, I. K. and S. T. Newsome, presumably sons. The first must be Jabez Kerby Newsome of 14 and 15 The Butts, Watch Manufacturer, who in 1896 was granted a patent for "Improvements in the Means and Method of Securing Bows to Keyless Watches." The letter "J" is a relatively recent addition to the alphabet and was often rendered as an "I" at the time. The second was Samuel Theo Newsome (1868-1930) died on 4 January 1930 aged 61. Newsome & Co. Advert 1894. Click image to enlarge. By 1894 Newsome and Co. had a London office at 94 Hatton Garden, EC, and were advertising as "Wholesale Watch Manufacturers. All kinds of English Lever Watches in Stock. Sole Makers of Patent Safety Wheel for Going Barrels. Keyless Work a Specialité with or without the Kew Certificate in "A," 46B," or "C" class... Illustrated catalogue on application." The firm's London agent was listed in 1897 as J. M. Joseph. By the time the London office had moved to 70 Hatton Garden, Joseph had been replaced by Charles Louis Ebeling. When the Lancashire Watch Company was founded in 1888, Coventry watchmakers were concerned that the supply of "frames", movements for finishing, from Prescot would cease, so they founded the Coventry Watch Movement Company. Samuel Yeomans was its first chairman. The company was initially under capitalised and struggled. When additional capital was introduced and automatic machinery purchased it found that the demands from Coventry watchmakers were too small to keep the machinery fully occupied so it diversified into the manufacture of bicycle and parts for the motor and aviation industries. 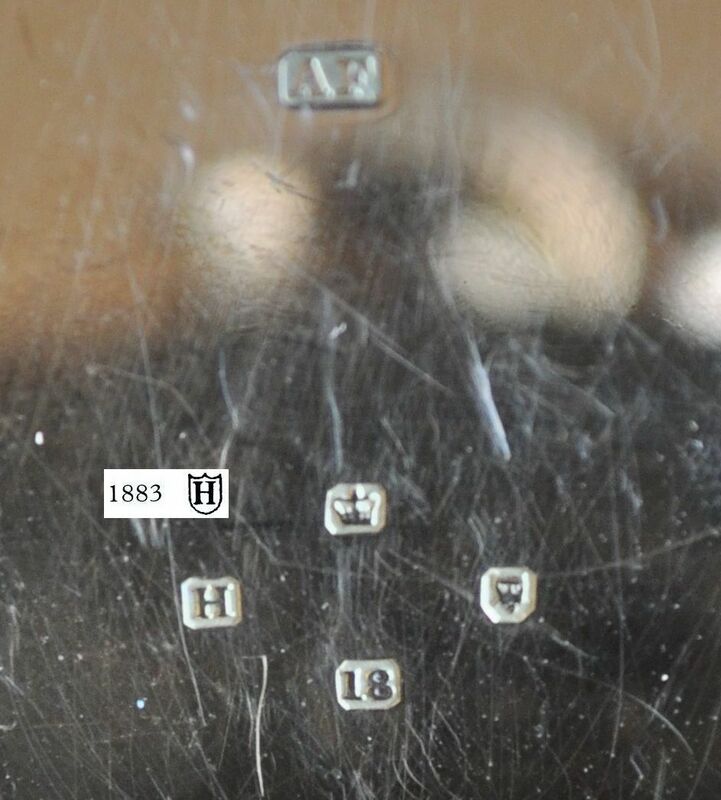 These hallmarks are in the case of a watch by the American Watch Co. of Waltham, MA, USA. The movement was of course made in America, but the case was made in Britain by Dennison in Birmingham, although their trademarks don't appear on this case. 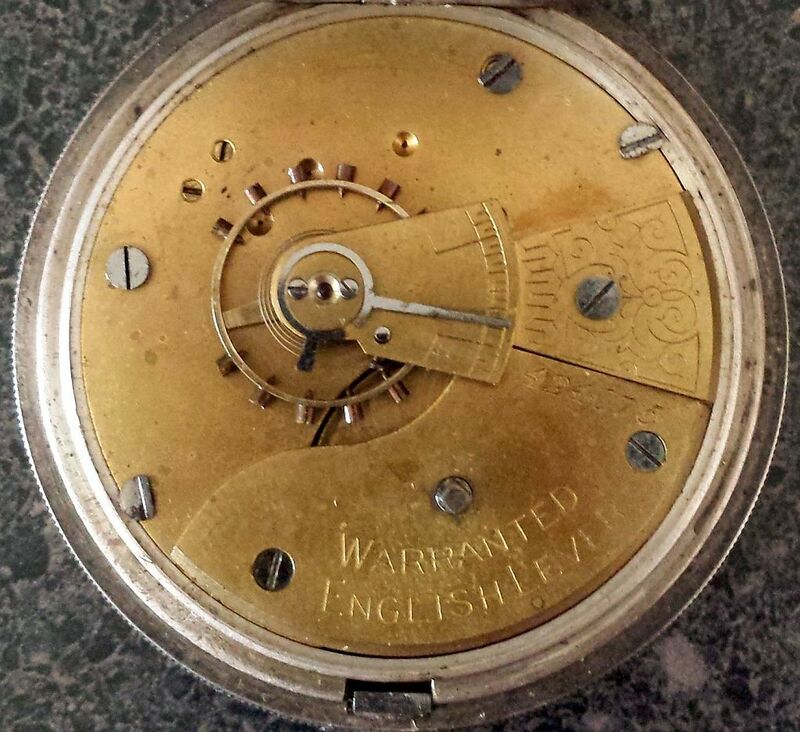 One can't be so certain about all Waltham watch cases with British hallmarks, because Bedford for Waltham had watch cases made in Britain, Switzerland and America, all of which they had hallmarked in Britain before the 1888 Merchandise Marks Act put a stop to that practice. In evidence to the Select Committee on hallmarking in 1878 Alfred Bedford, the manager of Waltham UK, said that they could not get enough watch cases made in England and that in 1877 Waltham UK had imported 5,000 watch cases from the USA and 18,000 from Switzerland. Bedford said that these were mostly hallmarked at Chester. To the Select Committee on the Merchandise Marks Amendment Act, which sat in 1887, Bedford said "At our case factory at Birmingham we turn out something like 50,000 cases a year for our watches." This factory is almost certainly what became the Dennison watch case factory. As I discuss on my page about assay and hallmarking, the 1887 Merchandise Marks Amendment Act made it illegal for foreign watch cases to be marked with British hallmarks like this from 1888 onwards, so this case was British made and given the relationship and history between Waltham and Dennison, this case was certainly made by the Dennison company. It appears that Waltham wanted Bedford's sponsors mark rather than Dennison's to appear on their watches. The date letter "Z": the date letter of the Birmingham hallmarking year 1899 to 1900. The sponsor's mark "A·B" in a rectangular shield, the registered mark of Alfred Bedford, director of Waltham UK. 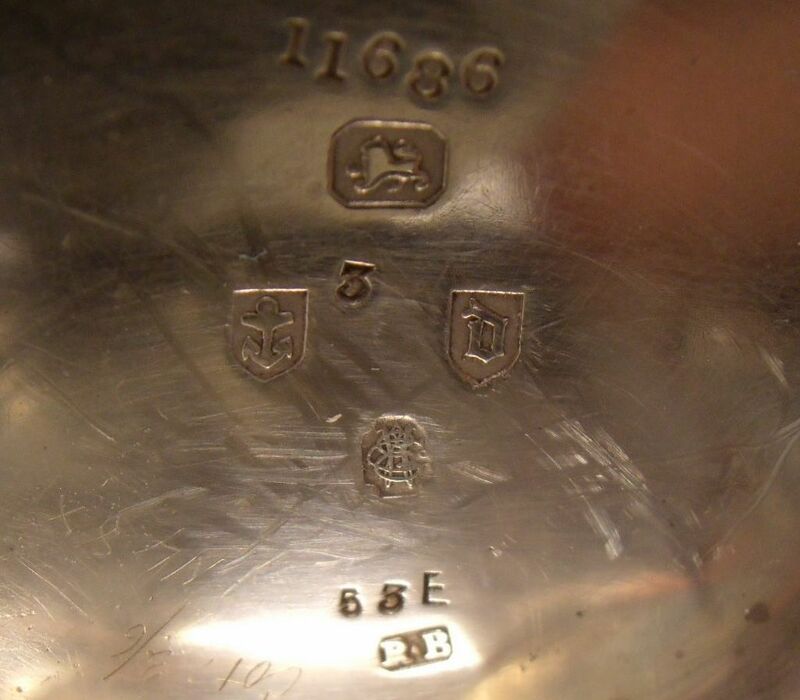 Note that the shields in this hallmark around the Birmingham Assay Office town mark and the date letter cameos are not the same shape as shown in the published tables but instead have a point at the base and cut top corners. This was a shape that the Birmingham Assay Office reserved for watch cases. Thanks to Richard Edwards for the picture of the hallmarks. 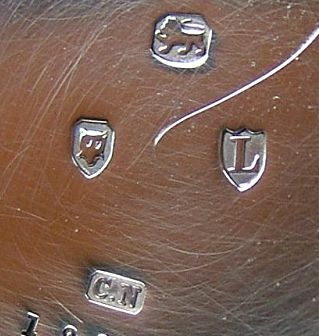 These hallmarks are in the Swiss made case of an IWC "Seeland" watch. A sword erect between three wheatsheafs (garbs): the town mark of the Chester Assay Office. The date letter "O": the date letter of the Chester hallmarking year 1877 to 1878. The sponsor's mark "AC" incuse in an oval incuse shield, the registered mark of Antoine Castelberg. IWC "Seeland" watches were made during the period from October 1876 to the summer of 1879 when IWC was under the control of of Frederic Francis (Frank) Seeland who was appointed to manage the IWC factory in October 1876, after the first company, founded by F.A. Jones, had gone bankrupt. The sponsor's mark is "AC" incised within an oval. 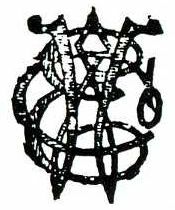 This mark was registered at the Chester Assay Office on 17 October 1877 and was the mark of Antoine Castelberg of 58 Holborn Viaduct, London, a watch dealer and importer from La Chaux-de-Fonds. Castelberg had several London addresses, his sponsor's mark was first registered with the London Assay Office on 25 August 1875 with the address 90 Newgate Street London. On 2 August 1876 he moved to 58 Holborn Viaduct. The incised mark registered to Castleberg is unusual because UK makers usually used cameo (relief) marks like the other assay office marks. 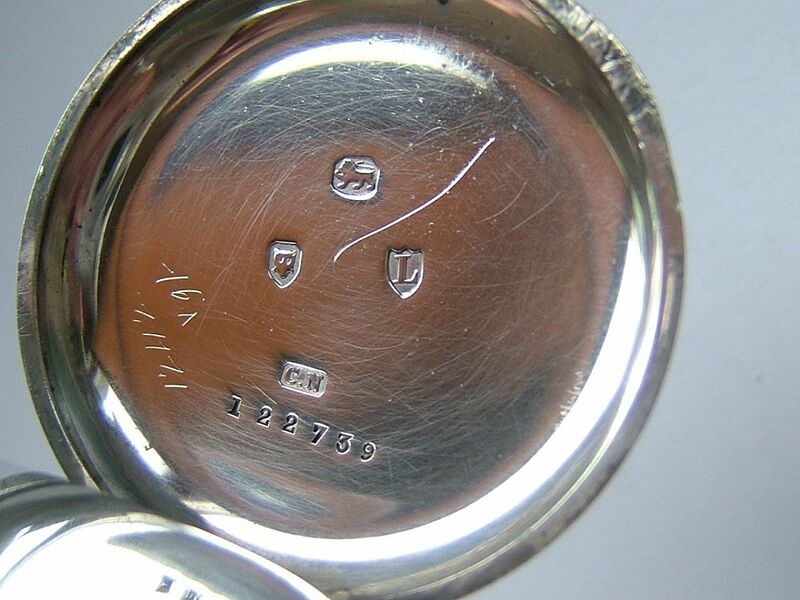 These hallmarks are in the Swiss made case of a Longines watch imported by Baume & Co. The sponsor's mark "AB" in an oval shield, the registered mark of Arthur Baume of Baume & Co. The date letter "B": the date letter of the London hallmarking year 1877 to 1878. You can read more about this history of this important watch manufacturer on my page about Longines. 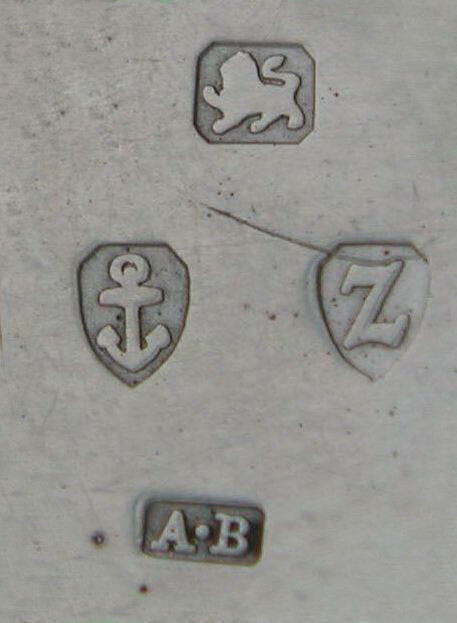 These hallmarks are in the Swiss made case of a Swiss watch imported by the Anglo/Swiss company Stauffer & Co. The date letter "L": the date letter of the London hallmarking year 1886 to 1887. The sponsor's mark "CN" in a rectangular shield with cut corners, the registered mark of Charles Nicolet, a director of Stauffer & Co. Thanks to Deveron Jewellers for the picture. Copyright © David Boettcher 2006 - 2019 all rights reserved. This page updated November 2018. W3CMVS.